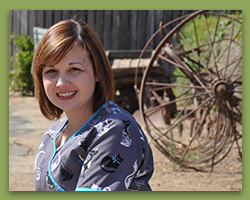 Carrie grew up in a rural area of Tulare county and has been a receptionist at Lone Oak since 2007. She lives with her two children and their Maltese/Poodle mix named Bear. She loves the outdoors, reading, and spends much of her time volunteering at her children's school and traveling to baseball games with her kids. Cassie was born in Tulare and graduated from Hanford High School. She lives with her husband, Bruce, and their daughter, Cheyenne. She loves animals and has been surrounded by them since birth. She enjoys spending her free time with family and friends, trips to the beach, and football. Go Niners! 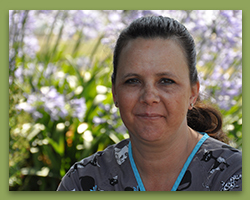 Donna grew up in the mountains of east San Diego county and has been with Lone Oak for over 10 years. She received her AA degree from Grossmont College in San Diego. She lives with a pack of Australian Shepherds, a Quarter horse, 3 cats, and 3 sheep. 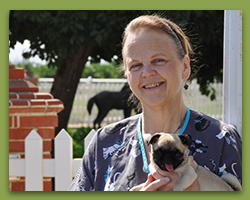 She spends her free time showing dogs, riding horses, gardening, and wine tasting. Dorraine was born is Dinuba and reared in Orosi. 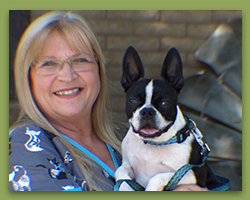 She graduated from Hartnell College’s Animal Health Technology program in 1983 and promptly started working at Lone Oak three days later. During the week we share her with Pope’s Propane Service which is a family business her dad started. She developed "horse fever" at a young age. Today her favorite pursuits are extreme horseman’s challenges and cattle sorting. She lives in rural east Orosi with her daughter, Sierra; son Forrest; three horses; three dogs; three cats; and a flock of chickens and ducks. Kelcey is from Bakersfield, California and moved to Visalia in 2005. 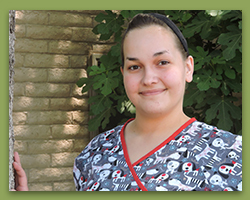 She has just under a year’s experience as a Veterinary Assistant and will graduate as a Registered Veterinary Technician in 2016 from San Juan College. She lives with “Trooper” (DSH) and “Heidi” (Pug) who she adopted from Lone Oak, as well as “Princess” (DSH) and “Jizzabelle “(DSH). Her interests include parasitology and laser therapy. In her spare time she enjoys video games and being involved with her church. 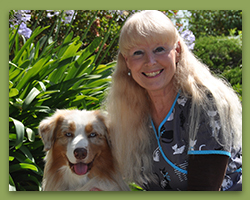 Laura Jane was raised in Visalia and has been surrounded by animals all her life. She has been working for Lone Oak off and on since opening in 1974. She has a Bachelor of Arts in Communication Arts and Science from Fresno State. She lives with her Pugs, “Bubba” and “Bug”. In her free time she enjoys theater, art, reading, and traveling. 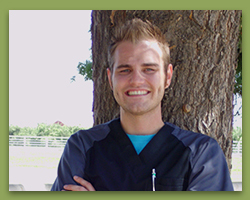 Marcus grew up in Visalia and has been a Veterinary Assistant at Lone Oak since 2007. He is attending the Penn Foster College to get his Associates of Science degree in Veterinary Technology. He lives with his husband, Justin, who works at our local SPCA; Australian Shepherd, “Gia”; Pitbull, “Tanner”; Chihuahua, “Nicki”; Terrier, “Lilly”; Domestic Shorthair, “Bowie”; Domestic Medium Hair, “Capone” and “Curtis Conner”, the Bearded Dragon. Marcus and Justin enjoy helping animals in need and open their home to fostering pets from local shelters. Nicole grew up in Southern California. She lives with her husband, Nathan; children, Ryden and Eden; Pitbull, “Bullet”; grey tabbies, “Yammi” and “Baby”. 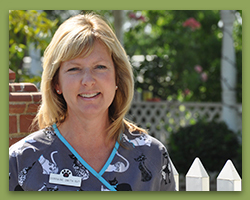 She has worked at Lone Oak Veterinary Clinic since 2008. 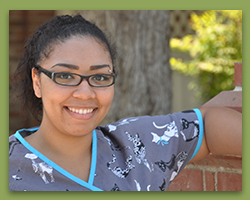 She attended College of the Sequoias, earning a Veterinary Assistant certificate. In her free time she likes to bake, crochet, and have mommy time. 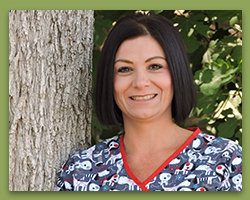 Heather was born in Reedley and raised in Dinuba. 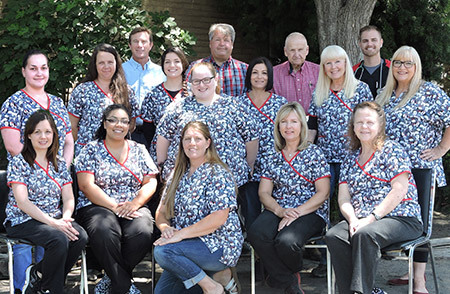 She obtained her Associate of Science in Veterinary Technology from San Joaquin Valley College in 2015 before starting work at Lone Oak. She still lives in Dinuba with her dad and their small group of dogs; Tokyo, Piglet, C.C. and Power Plant. In her free time she enjoys video games, books and spending time/relaxing with her family. Amanda was born and raised in Tulare. 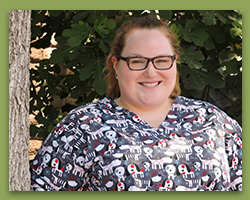 She started working at Lone Oak in 2015, after receiving an A.S. degree in Veterinary Technology at SJVC Fresno. Her interests include orthopedics, physical therapy and spending her days with “Demetri” the Doberman Pinscher, “Solomon” the Bearded Dragon, and “Ethan” the Boyfriend!